Martha Jane is the smallest possible true sharpie with adequate accommodations for two. It is well known that good sharpies offer the most performance for the least investment of time and money. This makes Martha Jane a wolf in sheep's clothing, as she is an owner built boat that will out sail and outclass most other boats her size. Martha Jane might look old fashioned, but she is actually a very modern yacht. Her 500 lb. of water ballast gives her power under sail and the safety of being self righting, dump it out for ease of trailering. Her balanced lug sail cat yawl rig sets a lot of sail down low and is powerful and efficient both on and off the wind. Her tabernacle mast can be easily lowered for ease of trailering, to get under low bridges or escape a real blow. Her leeboards, combined with her kick up rudder, make her a true shallow water sailor without the maintenance headaches or interior clutter of a centerboard trunk. Of course she is self bailing. Mike O'Brien, senior editor of 'Wooden Boat' magazine, says in #80, 'Built as drawn, Martha Jane should be self-bailing, self righting, unsinkable, easily trailer able, and fast under sail. She's a most significant sharpie.' For those who want a fast, comfortable and trailer able cruiser for two, or a spirited day-sailor for more, Martha Jane is the boat. No other small sharpie even comes close. 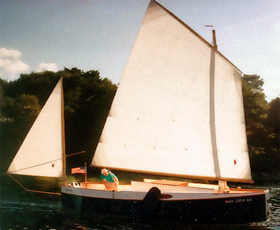 Martha Jane From Wooden Boat #80, Designs, and Martha Jane: by Mike O'Brien. Sharpies, in their simplest flat bottomed form, hold strong fascination for sailors and architects. They offer, perhaps, the most performance for the least investment. Martha Jane is the latest thin-water cruiser from the board of Philip C. Bolger --an acknowledged master of the modern sharpie design. Don't be misled by the little yawl's radical appearance. Almost every detail of rigging and hull design has been proven in her designer's earlier work. Bolger's sharpies always show adequate rocker in their bottoms, and heels of their stems are carried well clear of the water. This configuration reduces cross flow at the chine's, resulting in better performance--particularly in light air. The docile steering demonstrated by these shoal-draft cruisers will be appreciated by anyone who has wrestled with sharp-ended flat-bottomed boats in heavy weather. You'll notice that this new sharpie has rectangular sections. 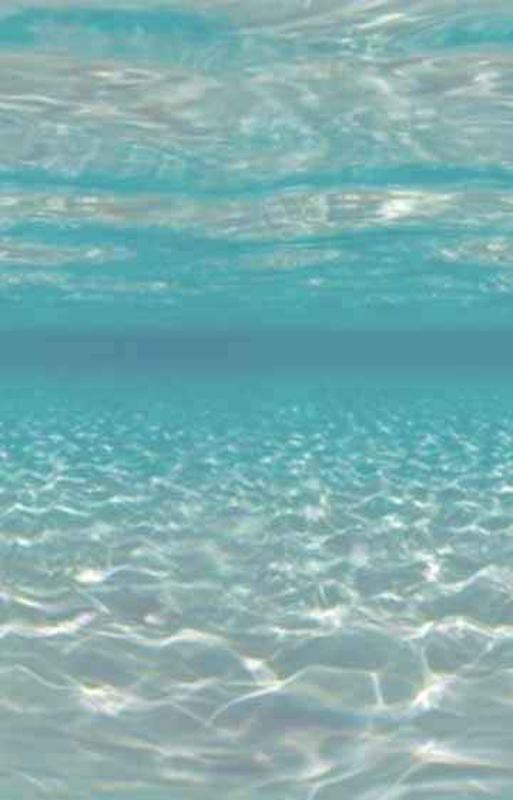 Her sides stand perfectly perpendicular to the water's surface. Weren't we brought up to respect flare as one of nature's absolutes? We might have argued about how much was appropriate, but that there would be some flare was never in doubt. Be that as it may, arguments can be presented in favor of rectangular sections. For boats with Martha Jane's proportions, vertical sides can result in nicely drawn-out waterlines, maximum initial stability, easier construction, and slightly reduced materials costs. Some plumb-sided skiffs and canoes have earned reputations as ugly, bad tempered monsters. These very small craft are usually unballasted, and the crew weighs much more than the boat. If, as the load increases, the depth of the immersed rectangular section becomes too great compared to its width, there are problems. When the boat is healed, the center of buoyancy can slip to the wrong side of the center of gravity with alarming suddenness, causing almost instantaneous inversion. With her predictably lighter relative loading and greater beam producing shallow immersed rectangular sections, Martha Jane (carrying 500 lb. of seawater ballast) should display a reasonably friendly stability curve. You might object to vertical sides on aesthetic grounds; perhaps they--along with painfully dry white wine, black olives, and your favorite music--represent acquired taste. Bolger summed up his feelings about this controversial matter in a letter to a British Boat builder: 'I'm convinced that these rectangular-sectioned boats are functionally superior as well as highly economical of time and material, but it's hard to get the point across...as most people can't grasp that the behavior they like is due to the looks they don't like. Martha Jane's construction plan shows Bolger's clean and clever way of working with plywood. A few bulkheads combine with stringers to produce great rigidity without the clutter of extensive transverse framing. Virtually every element in the design adds to the boat's strength--sliding hatch rails serve as supporting girders for the deck, and leeboard guards strengthen the sides. Assembly is 'instant boat' fashion--a refinement of traditional skiff-building methods. Bolger provides drawings showing the real or expanded shape of the sides. These are recreated at full scale directly on the plywood, cut out, and wrapped around the molds. True lofting and building jigs aren't needed. This is easy work for rank amateurs and fast work for experienced hands. Leeboards have become a trademark of Bolger sharpies. Because they live outside the hull, the boards don't intrude on the accommodations. The boat need not be holed for their installation, and the single biggest maintenance problem for shoal-draft wooden boats--the centerboard trunk--is eliminated. A leeboard need work on only one tack, and it can be oriented for maximum efficiency on port or starboard. The working board angles away from the hull, presenting a perpendicular face to the water as the boat heels. A small amount of toe-in relative to the boats centerline increases lift (some designers specify asymmetrical foils for this reason), but Bolger cautions against overdoing it. In extremely shallow water, leeboards remain effective long after centerboards must be fully retracted. Because they are ballasted only enough to make them sink readily, the immersed working leeboard 'weights' virtually nothing. At the same time, the other board rides completely clear of the water; its full weight in air helps keep the boat on it's feet. In effect, you have an uncomplaining crew member who is willing to hang 6" outboard of the weather rail forever. For this sharpie, Bolger specifies traditional Flemish leeboard 'hardware,' consisting of stout rope. As the boards are lowered the loops tighten, holding them firmly in position. Yet the weather board can 'broken wing' (swing away from the boat) if it's left lowered. For short handed short tacking, both boards can remain down. They're quite happy that way, and--because the rig is self tending--the skipper need only point the tiller properly. The kick-up inboard rudder is a new Bolger creation. Unlike blades that retract in into trunks, this arrangement should permit steering even when it's partly lifted. The designer describes its geometry as being the outcome of 'excruciating mental effort. Martha Jane shares the virtues of Wenda's (standing lug yawl rig, not shown), and adds a few of her own. Her unstayed rig can be struck in minutes--handy for trailering and comfort in a blow. The mainmast stands in tabernacle; with proper counterbalancing (about 90 lb. of lead), swinging it should be a one-handed operation. Measuring just 16' in height and 3" square at the partner, the mizzenmast will present no problems. Both the sprit-boomed mizzen and the balanced lug mainsail are more or less self-vaning and reduce concern about sheeting angles. Built as drawn, Martha Jane should be self-bailing, self-righting, unsinkable, easily trailer able, and fast under sail. She's a most significant sharpie.